Moving five tons of rock is easier than you might think, at least if Zachary Coffin has something to do with it. The Atlanta-born Coffin is the artist behind Rockspinner, a series of kinetic sculptures featuring skewered boulders that can be turned by hand or powered by solar energy. Rockspinner6, built in Atlanta, is now on display at the Atlanta Botanical Gardens, one of 30 pieces featured in the garden’s “Sculpture in Motion: Art Choreographed by Nature” exhibit through the end of October. But just how did Coffin, raised in Virginia-Highland and schooled at the Cooper Union in New York, become interested in boulders? “There was some point back in art school where I realized the thing I wanted to do is build giant toys,” he said. He got his first real chance while working at the Socrates Sculpture Park in Queens, when a construction crew offered him a boulder they unearthed. 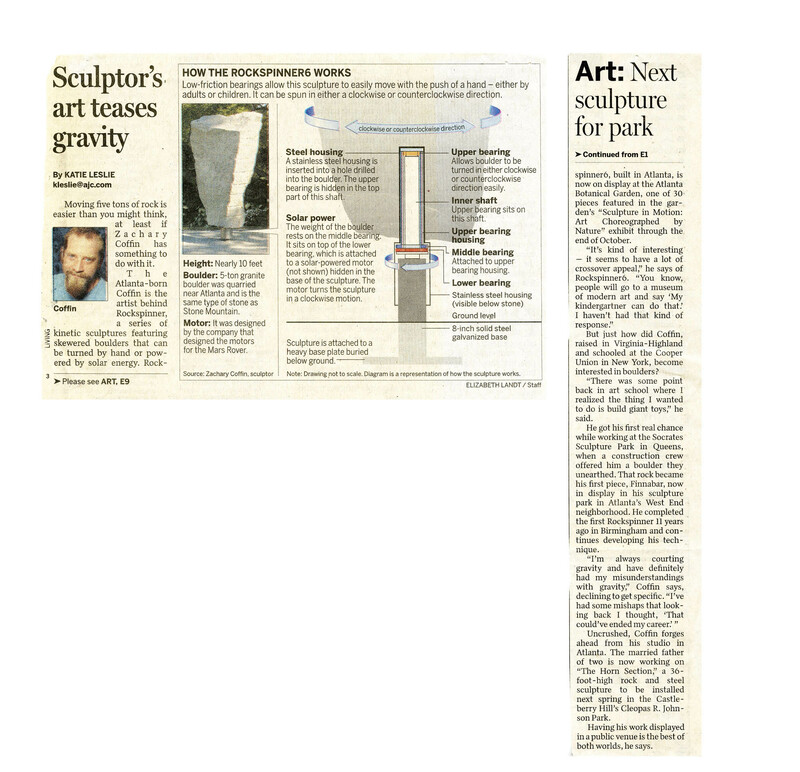 That rock became his first piece, Finnibar, now on display in his sculpture park in Atlanta’s West End neighborhood. He completed the first Rockspinner 11 years ago in Birmingham and continues developing his technique. Uncrushed, Coffin forges ahead from his studio in Atlanta. The married father of two is now working on “The Horn Section,” a 36-foot-high rock and steel sculpture to be installed next spring in the Castleberry Hill’s Cleopas R. Johnson Park. Having his work displayed in a public venue is the best of both worlds, he says. © Zachary Coffin | All rights reserved.